There's not a lot that a good cupcake can't cure. Let me tell you, cupcakes have often been my pick-me-up when the day hasn't been so sweet. Maybe it's a good thing that I no longer live close to NYC's Buttercup Bake shop! I am in cupcake testing madness (for a little project of mine that I'm thinking of getting together) and here is where I'm at. Citrus Cupcakes! Give them a try, and let me know what you think. Preheat oven to 350 F. In a small bowl, mix the flour, salt, lemon zest and baking powder. In a separate bowl, add the sugar and butter. Using a mixer, beat the sugar and butter until the mixture is homogeneous (about 3 minutes). Add the eggs, one by one, beating until just incorporated. Add the lemon juice, vanilla extract and lemon curd and beat until just incorporated. Slowly add the flour mixture. Once the mixture is just homogeneous, scoop one ice cream scoop of batter into a cupcake-lined muffin time. Bake for 15-20 minutes or until a toothpick inserted into the center of the cupcake comes out clean. Leave to cool on a cooling rack while you make the icing. Using a small whisk, whisk the lemon curd into the sour cream making sure to remove any lumps. Once the cupcakes have completely cooled, ice them. Enjoy! I like cupcakes, can I get in on this project? I'm a good taste tester. PS. Been to Cocoa Locale yet? Bless you for creating small batch recipes. These look wonderful. I love citrus desserts and your icing is to die for. I love lemon curd, I bet these were so good! I am on a lemon curd thing lately, don't know why (other then the obvious fact that I love lemon) but this is another perfect one to try! 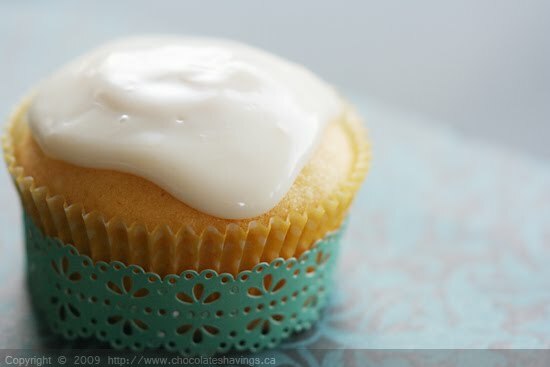 Lemon curd in the icing on lemon cupcakes... Mmm, must be delicious! oh my! im drooling over that icing! What a dreamy looking cupcake. I love the lemon icing! Looks amazing! Those are both dreamy looking and sounding! I have been looking at these for days thinking..hmmm, need to make them, they look fabulous! they look so dainty & delicate. Look delicious and normally, I would not like, lemon. These, I would try. so pretty to look at. I mean I would still eat them, but the photo is so pretty and elegant. I love lemon in ANY dessert. These cupcakes are calling my name! I love the lemon curd icing. These are great! Citrus flavors are some of my favorites, especially in baked goods. Thanks for stopping by my blog! oooo, I love all things lemon. Can't wait to test these babies out! Ah, lemon curd. Truly makes my heart sing. These look fantastic. I absolutely love your food, photographs and style! I'm so happy I found your blog ... I will make those cupcakes when I'm back from my trip next week. frockandfork: Thank you, I'm glad you like it! Let me know what you think of the cupcakes when you try them out!